When I recently visited the exhibition CR(I)SES AD(JUST)MENTS (COLLAPSED) at Flux Factory, a solo show by French artist Christine Laquet, I was immediately seduced by a white circular platform featuring red high-heeled shoes and imagery projected onto it from the ceiling. The images fluctuated between close-ups of slow-moving jellyfish and blurry snow scenes, and were accompanied by a captivating audio track. Titled “If by love possessed,” the audio is an interview Laquet did with a “Doctor in Monsterology” — a discussion of what, where, and who could be the contemporary monster, read by a teenage girl. The exhibition revolves around a mysterious, mythological, and even at times ambiguous idea of “monstrous metaphors” that are born out of economic crashes. Laquet looks at the Great Depression of 1929 and how, in 1933, four years after Black Thursday, King Kong became a popular icon in the historic birthplace of finance, in her own words “simultaneously embodying the savage, the transgressive, and the monstrous.” With this as her starting point, she examines our current situation and uses the exhibition as both a brainstorming session and an interpretation of metaphors that, according to the press release, “have yet to arise.” With an emphasis on and understanding of our need for mythology, Laquet is asking: what is the monster of our time? Using historical documents, research, and her own ideas and imagination, she created films, performances, sculptures, and installations that morph into a exhibition full of symbols, slivers of compelling narratives, cultural projection, and literary reflection. The pieces stand separately but also flow into each other, with obscure borders. The opening for the show doubled a book launch for a publication in which she invited different writers to reflect on her ideas. (Full disclosure: I contributed a short piece.) As I made my way through the gallery and the book, I felt simultaneously absorbed and overwhelmed by the vast scope of the concepts being addressed. But only in experiencing them together did I clearly understand one point Laquet is emphasizing — that the monster metaphor today is a formless, transparent shape shifter. Her use of glass is literal but not simple. She delves into its history and role in civilization, from the construction of buildings to the current use of fine fibers to reinforce a plastic matrix in fiber optics for the internet. She occasionally uses it more symbolically, as in a series of images based on Associated Press photographs of stock market traders from 1929. She couldn’t get the rights to use them unless she paid, so she reproduced them instead, by drawing, enlarging, and finally silk-screening the images onto mirrored Plexiglass with a rainbow color, like the spectrum of light passing through the surface. One central piece in the exhibition, titled “To Gain your own voice, you have to forget having it heard” (a quote from Allen Ginsberg), is a dramatically edited 18-minute HD video of a performance that happened a month ago at Flux Factory, with deaf actress Alexandria Wailes and drummer Gerard Faroux. Laquet gave the actress three things: stock market traders’ hand signals, Occupy Wall Street hand signals, and a list of financial words like “future” and “market” that Wailes translated to sign language. Laquet then asked the pair to create a strong relationship as they performed, despite the fact that the actress could not hear the drummer and the drummer could not understand the hand signals. In the opposite corner of the gallery was a piece titled “Creepy House, Act 1,” an eight-minute video installation that Laquet shot in Roswell, Georgia. The images are of the outside of a haunted house, and she was accompanied by a ghost tour guide who points a flash light around the structure, offering us only shadowy glimpses of it. The audio track is a voice-over of a written adaptation of Shakespeare’s The Tempest. Laquet is working with complex concepts, and she leaves a lot of room within each piece, and within the spaces between artworks, for the viewer to wander around and hear her as well as come up with his own ideas. She reaches into the relatively recent past to point out patterns and cycles, but also goes back to 3500 BCE, to Mesopotamia and the invention of glass, making a case for this material as inextricably tethered to civilization. The implication is that the current invisible monster is growing from a seed planted long ago. It reminded me of Anne Carson’s book Economy of the Unlost, in which she pinpoints 550 BCE, when the poet Simonides of Keos was the first artist paid a direct sum for his work, as the moment that changed the relationship between the gift and market economies in the arts forever. The exhibition is a critique of the invisible monstrosity of what happens when power goes awry, our acceptance of power going awry, our inability to even see it happening, and a call to arms. I’ve always thought of artists as people who operate slightly invisibly — a bit like Robin Hood, slipping through systems, walking a tightrope between society and the cosmos so they have a clear view of both but are not inside either. But Laquet raises the question: are we in an era where we cannot be outside anymore? What does it mean to live freely? Certainly the recent revelations that we are living in a kind of surveillance state play into this discussion. But inside the gallery I felt like she was telling us that we must invent our own languages — that there are so many ways to hear each other beyond detection. In his book The Soundscape, R. Murray Schafer writes, “Originally all sounds were original, but now, any sound no matter how tiny can be blown up and shot around the world.” Laquet’s exhibition felt like a sound, a clank that can be shot around the world, signaling that we have hit something and are entering a new cycle. She once titled a previous show of her work, “I see the sea and the sea sees me.” Water, when thin enough, is clear, but an ocean is a vast complexity of color and light reflection and refraction. This exhibition feels like we’re standing here, looking at a giant wave that’s suspended right in front of our eyes, and before it crashes we have a unique vantage point for studying its complexities. 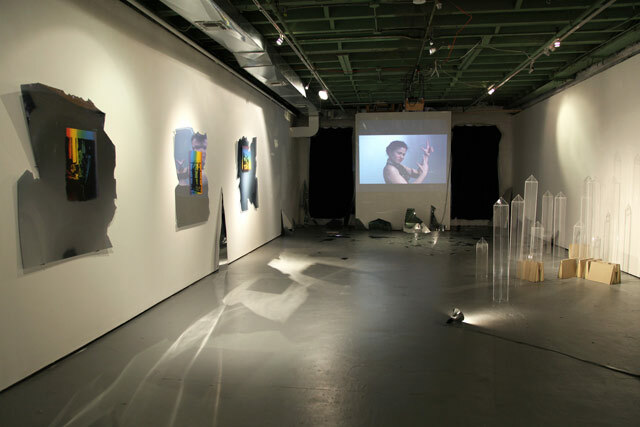 Christine Laquet’s CR(I)SES AD(JUST)MENTS (COLLAPSED) ran from June 8 to June 15 at Flux Factory (39-31 29th Street, Long Island City, Queens). Inquiries about book orders can be made by emailing souffle05@yahoo.fr.